Bullying involves a more powerful person or group attacking a less powerful one(1). Bullying undoubtedly threatens not only those who are victims, but onlookers as well. So if kids hear a classmate being taunted about being fat, dumb, or gay, they might worry that they also appear fat, dumb or gay and may be the next to be ridiculed. Kids who are continuously bullied suffer great affronts to their self-esteem, and some end up becoming bullies as well. According to Tonja Nansel, Ph.D., of the Division of Epidemiology, Statistics, and Prevention Research at the National Institute of Child Health and Human Development in Bethesda, MD, and colleagues, about 30% of a student sample of sixth through tenth graders surveyed by the World Health Organization (WHO) in 1998 reportedly had been involved in bullying, with the frequency of bullying higher for sixth through ninth graders than ninth through tenth graders(2). Thirteen percent of the students polled had bullied others, 10.6% had been victims of bullying, and another 6.3% had been both bullies and were bullied by others. Boys’ attacks were more physical (e.g. fighting, slapping, kicking, and pushing), while girls tended to use less aggressive forms of bullying, such as name-calling, teasing, spreading rumors, making sexual comments and rejecting others. The boys were more likely to bully both girls and boys, while girls usually only bullied other girls. Although parents and educators should understand the need for bullying intervention, it’s also important to recognize that even some perfectly healthy kids occasionally get caught up in bullying behavior. When this happens, it’s necessary for parents to label the behavior as bullying and be sure to correct it, but it’s just as important to assume a single incident, or even two, doesn’t necessarily predict a future of violence and crime. You will need to be assertively clear that bullying other kids—either physically or emotionally—is unacceptable. If you spend enough time around kids, you’re bound to hear them insulting or harassing others because they’re different in some way. Take that as a teaching opportunity to have a private discussion with your children afterward. Remind your kids that if they go along with the crowd and insult someone by using racial slurs or if they refer to people as gay, fat or geeky in a derogatory way, they’re contributing to the abuse of other innocent young people. Passive inaction can also be psychologically damaging. Kids may purposely not invite a classmate to a party or other social event because he or she is “different.” In a situation like this, you can discuss with your kids your disappointment in them for not accepting people with differences as friends and for perpetuating the prejudice against them. Be clear when telling your kids that your family accepts individual differences, including people of different shapes and sizes (e.g. fat, short, etc. ), religions, races or sexual orientation. Stress that if they belong to a crowd of peers who are mean to others, they’re in the wrong crowd. Teach your kids about respect for others so that they won’t be contributing to the misery of their peers. Walk away. The oldest recommendation for dealing with bullies is to ignore the taunts and walk away. It’s preferable for kids to be able to join a group of other friends, but that’s not always possible. It’s also important for victims of bullying to understand that it’s not their fault, and they shouldn’t blame themselves. Self-talk like, “What’s his problem? I’m OK,” helps victims cope with the emotional pain of teasing. Kids have told me that ignoring bullies can actually be effective some of the time, and their parents usually advise them to walk away from bullies. Discover an activity strength. Kids who are stars of a sport, speech, drama or math team soon find allies. Teammates don’t pick on one of their own if they want someone on their team, and bullies don’t taunt kids when they’re surrounded by friends who will defend them. Very few boys who are active in sports suffer much taunting. Although not all children can count on being team players in sports. Interests in speech, drama or band can also offer opportunities for kids to discover support groups in and out of school. When your kids sing solos or receive trophies for a math meet or wrestling match, the taunting can diminish a little while admiration grows. Every little bit helps. Find a peer ally. If kids have friends among the leaders of the class, having them privately tell the leaders how much the teasing hurts is a good plan. Kids will feel better if they communicate directly to friends and are successful in saving themselves. A prestigious friend may help to stave off bullies. Help a friend in need. Teachers may be able to help kids who are bullied by appointing them to tutor someone who needs help with homework or to assist a physically handicapped child with activities. Not only will that build their self-esteem, but it will help them to concentrate their energies on caring about others. Although there is no guarantee that the bullies will back off, even bullies can’t help but admire kids who go out of their way to help people with handicaps. Appeal to kids’ sensitive sides. Kids who taunt and insult others aren’t necessarily mean kids. That is, they may not realize that they’re hurting others. Adults, like teachers, can take leaders aside privately, appeal to their sensitive sides and get them to stop the teasing. Discussing the matter in front of peers could embarrass the leaders and unleash their power to taunt even more. This approach may be more effective with girls than boys, but it’s worth trying for both. Learn a sharp response. A sharp response, pointing out a taunter’s weaknesses, may incite fear in a taunter, which will eradicate any further slurs. “Haven’t you learned your multiplication facts yet?” or “You’re so small I could put you in my back pocket,” or “My six-foot brother is on the football team, and he doesn’t like it when little squirts like you call me names,” or “Coming from you, I consider that a compliment,” are effective for some kids. You’ll have to determine your child’s own courage level before you recommend he try to thwart bullies with a mean comment. That kind of response can backfire, and when kids fear their taunters may take them on physically, a smart response will probably not be effective. In these situations, it may be better to ignore the taunts, find a friend to play with or talk to a teacher for protection from the bullies. Fight back? I don’t recommend fighting back, but many parents do, and I admit that it may be effective for some kids. 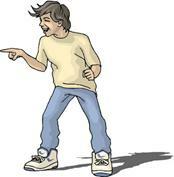 Victims may actually put a stop to bullies by giving them a kick in the shins or a punch in the nose. I don’t encourage hitting back for two reasons. The first reason is that it teaches kids to be aggressive in response to aggression, and it’s better for kids to solve problems verbally. The second reason is that the victim risks being physically beaten and feeling worse than before. Verbal assertiveness is much safer. Try to control the tears or anger until you’re at home, so the bullies don’t have another reason to tease you. Change the tears to laughter, or make a joke and disarm the crowd while also relieving some of your own tension. Find a close friend who will support you and walk as far away as possible. Talk privately to a teacher or principal who is in a powerful position to change the bullying behavior by speaking with the bully. Reassure your children. Your kids deserve reassurance that they are good, smart and effective people, despite what others may say or do. They also need to learn coping strategies, so they don’t play the victim. You should be supportive of their feelings but don’t host a daily pity party. It’s not helpful to your kids to allow them to dwell in self-pity. Sometimes kids learn they can get plenty of attention from a parent when they describe how mean others are. Of course, if they truly are hurt, they need you to believe them, but they also need advice that will move them forward toward their strengths and interests. Helping your kids develop their personal strengths can guide them toward positive accomplishments that will eventually build their self-esteem. Deal with depression. If your child seems depressed, schedule an evaluation by a psychologist. Depression can be a serious problem and should not be ignored or dismissed. Symptoms of depression such as excessive sleeping, having difficulty waking in the morning, refusing to go to school, complaining of stomach-aches or headaches, withdrawing from social or school activities and declining grades should alert you to seek professional help. Rely on an authority. 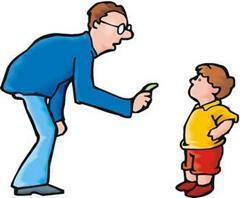 If your child feels threatened, it may be necessary for you to report the problem to the appropriate authorities. Furthermore, even if your child is afraid to be called a tattler, you may have to encourage him or her to report serious threats to an authority immediately. Explain that there’s a difference between tattling and reporting. Tattlers tell authorities just to get another person into trouble, and they’re not really worried about the consequences for themselves or others. However, if kids believe they or others may not be safe, it’s always appropriate to report the situation to an authority figure that can provide protection, and that kind of reporting is definitely not tattling. Many of the kids who instigate bullying haven’t experienced consistent family love, nor have they learned to respect boundaries. They may indeed be brought up in environments where they aren’t taught self-control or respect for others. Some kids who are bullies have also been bullied in their own homes by family members, or they copy bullying they have observed. Parents of kids who bully may need classes on managing their own anger and on parenting strong-willed children to help curtail their children's aggressive behaviors. Overempowered kids learn about limits and respect only when parents and schools set clear, reasonable rules and consequences. Assuming that children can handle their own problems is a mistake too many parents and teachers make. With bullies, who by definition are more powerful than other children, innocent kids may not be able to protect themselves and may require adult surveillance and support. Supervising playgrounds, hallways, cafeterias, parking lots and busses should be part of anti-bullying programs. Milwaukee’s WITI FOX 6 News did an investigative report of bullying on playgrounds in the five largest school districts in Wisconsin(3). Students were videotaped punching and kicking each other at more than two-thirds of the 52 school playgrounds observed. Plenty of the bullying resulted in kids getting hurt. 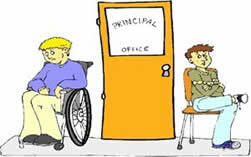 Teachers and supervisors who were in scarce supply never seemed to notice the rough activity or the bullying assaults. Unfortunately, Wisconsin schools aren’t alone with this problem. Schools also have the responsibility of teaching kids about respect as well as addressing the issue of bullying through intervention programs. Prevention programs for bullying that involve school-wide commitment have proven to reduce bullying by 50%(4). While programs that only target individual bullies haven’t been effective in curtailing bullying, approaches that have worked in schools include raising awareness about bullying, educating teachers and parents about bullying and providing support and protection for all students. Encouraging kids to pledge that they won’t bully others and that instead they will help others who are bullied diverts overempowered kids to protecting others. Schools can lead a No-Name-Calling Week, a national campaign that began in March 2004, which strives to eliminate bullying by educating students on its effects(5). School programs can provide an atmosphere where a social norm against bullying prevails, and kids, hopefully, become kinder and nicer to each other. As a parent or educator, you can encourage school programs and legislation, which provide legitimacy and clout for preventing bullying. (1)Excerpted from Rescuing the Emotional Lives of Overweight Children: What Our Kids Go Through - And How We Can Help by Dr. Sylvia Rimm (Rodale, 2004). ©2008-2014 by Sylvia B. Rimm. All rights reserved.